Happy New Year! 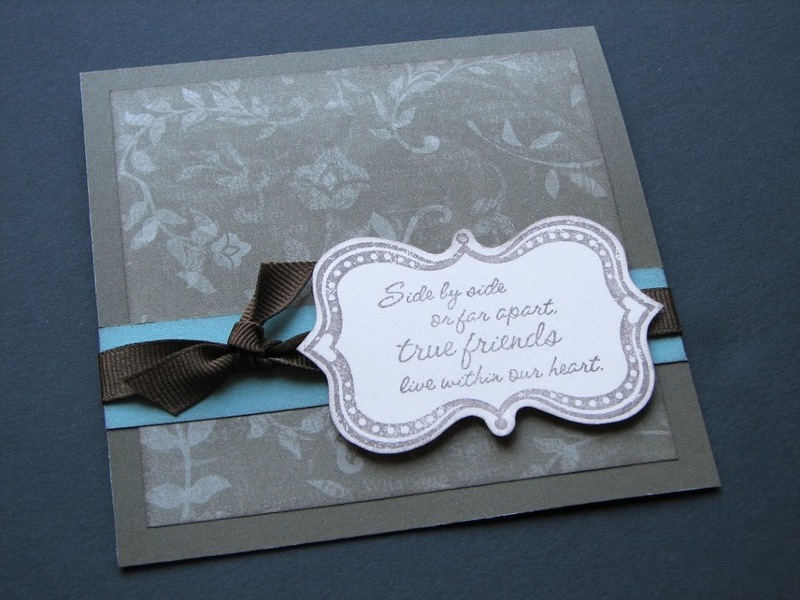 Welcome to another blog hop featuring Close To My Heart’s Stamp-of-the-Month. If you came here from Tammy’s blog, you’re on the right track. If you’re starting here, don’t worry this hop is one big circle, so you’ll end up back here. Curl up with a cup of tea or coffee and settle in to enjoy all the inspiration. This month’s set is called True Friends and it’s beautiful. It has lovely sentiments and frames, as well as the ever popular bracket and parenthesis. I had fun working with this stamp set and some brand new products that are included in the Spring 2010 Idea Book. This first card uses the new paper pack entitled Topstitch, our new Soft Suede Pinwheel flowers (that’s real stitching on them), new Bitty Sparkles (there’s now 100 of these cuties in their own package!) and chocolate cardstock, ink and brad. I inked the edges of all the paper, including the pinwheels. For this card, I used the back of a piece of paper from Veranda, another new paper pack, as well as some juniper cardstock and cocoa cardstock, ink and ribbon . This is a very simple card, but I think the paper adds so much to the design. Both of these card patterns were taken from Wishes. Now, you’re off to see Shannon’s beautiful work. Both cards are very nice, but I really like the circle card. Great job! Love the circle card because I love Topstitch! Love the circle card, nicely put together! Wow, I really like that back side of the Veranda paper…I think I’ll go check that out right now. Very classy card and your right, it is elegant that way. Your cards are gorgeous! The bitty sparkles take the cake on the Topstitch card, and the elegant simplicity of this stamp set with the back of the Veranda paper is just lovely! Happy 2010! 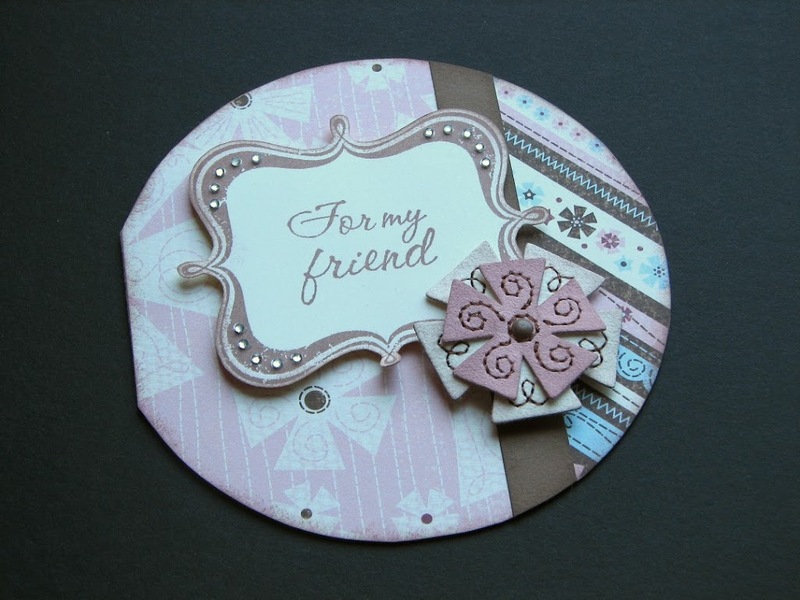 I love the circle card with the suede pinwheels – aren’t they FUN! Distressing them….how clever! Great cards, my favorite is the circle one! Love the topstitch card!!! such gorgeous cards!! Your cards are beautiful. I love the suede flowers! Those cards are beautiful – love the circle one! Krista they are both darling…I am in love with Topstitch!! Your circle card is darling. I love the backside of the veranda paper mounted on the same color cardstock, it’s very elegant! How cute…LOVE the sparkles and the pinwheels on the circle card! Your work is beautiful…I really like what you did with the second card! Your cards are beautiful, especially the circle card. Both cards are beautiful but my favorite is the circle card. I just love those! Gorgeous!!!! Wow Krista!! These are both gorgeous!! LOVE THEM both!! So pretty! Can’t wait to play with the Topstitch paper myself. Really like the way you used the bitty sparkles on the frame. Love these! Can’t wait to play with the Topstitch papers! Great cards – the circle one is my favorite! I love what you’ve created – TFS!